In last week’s blog post, I demonstrated how to perform facial landmark detection in real-time in video streams. 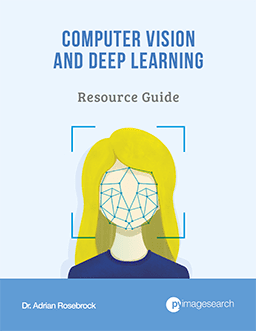 Today, we are going to build upon this knowledge and develop a computer vision application that is capable of detecting and counting blinks in video streams using facial landmarks and OpenCV. 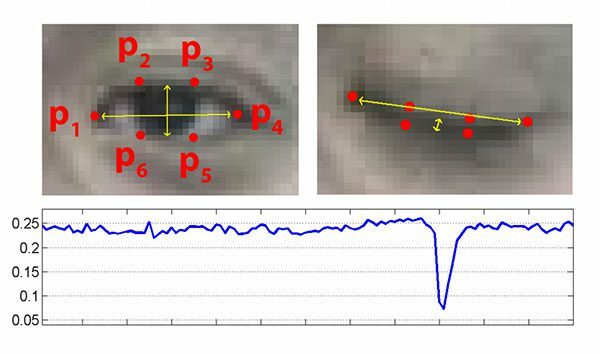 To build our blink detector, we’ll be computing a metric called the eye aspect ratio (EAR), introduced by Soukupová and Čech in their 2016 paper, Real-Time Eye Blink Detection Using Facial Landmarks. Determining if the “white” region of the eyes disappears for a period of time (indicating a blink). The eye aspect ratio is instead a much more elegant solution that involves a very simple calculation based on the ratio of distances between facial landmarks of the eyes. This method for eye blink detection is fast, efficient, and easy to implement. To learn more about building a computer vision system to detect blinks in video streams using OpenCV, Python, and dlib, just keep reading. Our blink detection blog post is divided into four parts. In the first part we’ll discuss the eye aspect ratio and how it can be used to determine if a person is blinking or not in a given video frame. From there, we’ll write Python, OpenCV, and dlib code to (1) perform facial landmark detection and (2) detect blinks in video streams. Based on this implementation we’ll apply our method to detecting blinks in example webcam streams along with video files. Finally, I’ll wrap up today’s blog post by discussing methods to improve our blink detector. Figure 1: Detecting facial landmarks in an video stream in real-time. Figure 2: Applying facial landmarks to localize various regions of the face, including eyes, eyebrows, nose, mouth, and jawline. In terms of blink detection, we are only interested in two sets of facial structures — the eyes. Figure 3: The 6 facial landmarks associated with the eye. There is a relation between the width and the height of these coordinates. Figure 4: The eye aspect ratio equation. 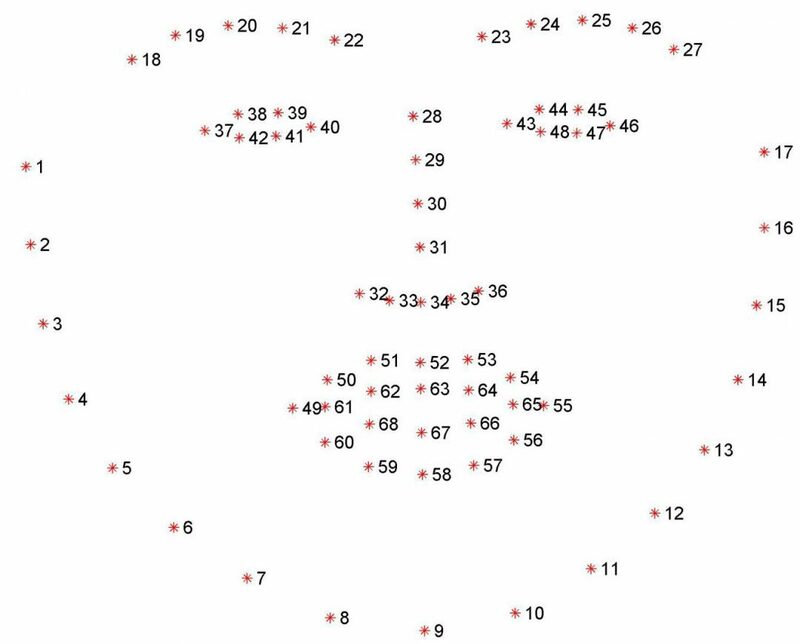 Where p1, …, p6 are 2D facial landmark locations. The numerator of this equation computes the distance between the vertical eye landmarks while the denominator computes the distance between horizontal eye landmarks, weighting the denominator appropriately since there is only one set of horizontal points but two sets of vertical points. Why is this equation so interesting? Well, as we’ll find out, the eye aspect ratio is approximately constant while the eye is open, but will rapidly fall to zero when a blink is taking place. Using this simple equation, we can avoid image processing techniques and simply rely on the ratio of eye landmark distances to determine if a person is blinking. Figure 5: Top-left: A visualization of eye landmarks when then the eye is open. Top-right: Eye landmarks when the eye is closed. Bottom: Plotting the eye aspect ratio over time. The dip in the eye aspect ratio indicates a blink (Figure 1 of Soukupová and Čech). On the top-left we have an eye that is fully open — the eye aspect ratio here would be large(r) and relatively constant over time. However, once the person blinks (top-right) the eye aspect ratio decreases dramatically, approaching zero. The bottom figure plots a graph of the eye aspect ratio over time for a video clip. As we can see, the eye aspect ratio is constant, then rapidly drops close to zero, then increases again, indicating a single blink has taken place. In our next section, we’ll learn how to implement the eye aspect ratio for blink detection using facial landmarks, OpenCV, Python, and dlib. To access either our video file on disk ( FileVideoStream ) or built-in webcam/USB camera/Raspberry Pi camera module ( VideoStream ), we’ll need to use my imutils library, a set of convenience functions to make working with OpenCV easier. Otherwise, most of our imports are fairly standard — the exception is dlib, which contains our implementation of facial landmark detection. If you haven’t installed dlib on your system, please follow my dlib install tutorial to configure your machine. This function accepts a single required parameter, the (x, y)-coordinates of the facial landmarks for a given eye . Lines 16 and 17 compute the distance between the two sets of vertical eye landmarks while Line 21 computes the distance between horizontal eye landmarks. Finally, Line 24 combines both the numerator and denominator to arrive at the final eye aspect ratio, as described in Figure 4 above. Line 27 then returns the eye aspect ratio to the calling function. --shape-predictor : This is the path to dlib’s pre-trained facial landmark detector. You can download the detector along with the source code + example videos to this tutorial using the “Downloads” section of the bottom of this blog post. --video : This optional switch controls the path to an input video file residing on disk. If you instead want to work with a live video stream, simply omit this switch when executing the script. When determining if a blink is taking place in a video stream, we need to calculate the eye aspect ratio. If the eye aspect ratio falls below a certain threshold and then rises above the threshold, then we’ll register a “blink” — the EYE_AR_THRESH is this threshold value. We default it to a value of 0.3 as this is what has worked best for my applications, but you may need to tune it for your own application. We then have an important constant, EYE_AR_CONSEC_FRAME — this value is set to 3 to indicate that three successive frames with an eye aspect ratio less than EYE_AR_THRESH must happen in order for a blink to be registered. Again, depending on the frame processing throughput rate of your pipeline, you may need to raise or lower this number for your own implementation. Lines 44 and 45 initialize two counters. COUNTER is the total number of successive frames that have an eye aspect ratio less than EYE_AR_THRESH while TOTAL is the total number of blinks that have taken place while the script has been running. The dlib library uses a pre-trained face detector which is based on a modification to the Histogram of Oriented Gradients + Linear SVM method for object detection. We then initialize the actual facial landmark predictor on Line 51. You can learn more about dlib’s facial landmark detector (i.e., how it works, what dataset it was trained on, etc., in this blog post). Figure 6: The full set of facial landmarks that can be detected via dlib (higher resolution). Using these indexes we’ll be able to extract eye regions effortlessly. If you’re using a file video stream, then leave the code as is. Otherwise, if you want to use a built-in webcam or USB camera, uncomment Line 62. For a Raspberry Pi camera module, uncomment Line 63. If you have uncommented either Line 62 or Line 63, then uncomment Line 64 as well to indicate that you are not reading a video file from disk. On Line 68 we start looping over frames from our video stream. If we are accessing a video file stream and there are no more frames left in the video, we break from the loop (Lines 71 and 72). Line 77 reads the next frame from our video stream, followed by resizing it and converting it to grayscale (Lines 78 and 79). We then detect faces in the grayscale frame on Line 82 via dlib’s built-in face detector. Line 89 determines the facial landmarks for the face region, while Line 90 converts these (x, y)-coordinates to a NumPy array. Using our array slicing techniques from earlier in this script, we can extract the (x, y)-coordinates for both the left and right eye, respectively (Lines 94 and 95). From there, we compute the eye aspect ratio for each eye on Lines 96 and 97. Following the suggestion of Soukupová and Čech, we average the two eye aspect ratios together to obtain a better blink estimate (making the assumption that a person blinks both eyes at the same time, of course). You can read more about extracting and visualizing individual facial landmark regions in this post. Line 111 makes a check to see if the eye aspect ratio is below our blink threshold — if it is, we increment the number of consecutive frames that indicate a blink is taking place (Line 112). Otherwise, Line 116 handles the case where the eye aspect ratio is not below the blink threshold. In this case, we make another check on Line 119 to see if a sufficient number of consecutive frames contained an eye blink ratio below our pre-defined threshold. If the check passes, we increment the TOTAL number of blinks (Line 120). We then reset the number of consecutive blinks COUNTER (Line 123). To see our eye blink detector in action, proceed to the next section. Before executing any of these examples, be sure to use the “Downloads” section of this guide to download the source code + example videos + pre-trained dlib facial landmark predictor. From there, you can unpack the archive and start playing with the code. Over this past weekend I was traveling out to Las Vegas for a conference. While I was waiting for my plane to board, I sat at the gate and put together the code for this blog post — this involved recording a simple video of myself that I could use to evaluate the blink detection software. Later, at my hotel, I recorded a live stream of the blink detector in action and turned it into a screencast. This blog post focused solely on using the eye aspect ratio as a quantitative metric to determine if a person has blinked in a video stream. However, due to noise in a video stream, subpar facial landmark detections, or fast changes in viewing angle, a simple threshold on the eye aspect ratio could produce a false-positive detection, reporting that a blink had taken place when in reality the person had not blinked. Computing the eye aspect ratio for the N-th frame, along with the eye aspect ratios for N – 6 and N + 6 frames, then concatenating these eye aspect ratios to form a 13 dimensional feature vector. Training a Support Vector Machine (SVM) on these feature vectors. Soukupová and Čech report that the combination of the temporal-based feature vector and SVM classifier helps reduce false-positive blink detections and improves the overall accuracy of the blink detector. In this blog post I demonstrated how to build a blink detector using OpenCV, Python, and dlib. The first step in building a blink detector is to perform facial landmark detection to localize the eyes in a given frame from a video stream. 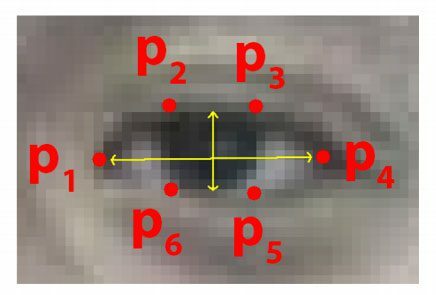 Once we have the facial landmarks for both eyes, we compute the eye aspect ratio for each eye, which gives us a singular value, relating the distances between the vertical eye landmark points to the distances between the horizontal landmark points. Once we have the eye aspect ratio, we can threshold it to determine if a person is blinking — the eye aspect ratio will remain approximately constant when the eyes are open and then will rapidly approach zero during a blink, then increase again as the eye opens. To improve our blink detector, Soukupová and Čech recommend constructing a 13-dim feature vector of eye aspect ratios (N-th frame, N – 6 frames, and N + 6 frames), followed by feeding this feature vector into a Linear SVM for classification. Of course, a natural extension of blink detection is drowsiness detection which we’ll be covering in the next two weeks here on the PyImageSearch blog. To be notified when the drowsiness detection tutorial is published, be sure to enter your email address in the form below! Looks very interesting as usual! I saw on Twitter that you got dlib working on Raspi. Are you planning a tutorial on installing dlib on Raspi? Correct — the dlib + Raspberry Pi install blog post will go live next week (May 1st, 2017). This looks great. I like the fact that you explain the science behind it all. Should we be using Python 2.7 or 3.0? You can use either Python 2.7 or Python 3. When i run the code, i get following two lines in output and not opening any video. Hi Adrian,Very thanks for you code. It sounds like your version of OpenCV was compiled without video support. I would suggest re-compiling and re-installing OpenCV using one of my tutorials. Hi Jorge — please check my reply to “haili” above. You’ll want to compile OpenCV with video support so you can access your webcam. Hi Adrian. Thanks for your great job!! Congrats on resolving the issue Jorge, thank you for sharing. You typically wouldn’t use facial landmarks directly for face recognition. Instead you would try Eigenfaces, Fisherfaces, and LBPs for face recognition (covered inside the PyImageSearch Gurus course. Otherwise, you would look into OpenFace. Hi.Thanks for this post.so useful. I have a question.openface just install on linux or we can install it on windows?? Very cool! Great post. Thanks!! Thanks Christian, I’m glad you enjoyed it! Thanks for sharing! As I mentioned in the post, it might take a little tweaking depending on the frame processing rate of the system. It is interesting to note that the green outlines around my eye always seem to show both eyes are roughly the same amount open, even when one eye is completely wide open and the other eye is entirely shut. Looks like the facial landmark detector (HOG) is making some assumption that the face should be symmetric, so both eyes should be about the same. The face detector is HOG-based. The facial landmark predictor is NOT HOG-based. Instead it interprets these landmarks as probabilities and attempts to fit a model to it. You can read more about the facial landmark detector here. I downloaded the zip file and executed the required command in terminal. I’m using a macOS Sierra. can you please help me figure this out. Make sure you are executing your Python script from the same directory as the .dat file. Based on your error message, it seems like your paths are incorrect. thanks for the detailed turorial! now I do not know how to solve it. can you please help me solve the problem. Hi Jack — I don’t officially support Windows here on the PyImageSearch blog, I highly recommend you use a Unix-based environment such as Linux or macOS to study computer vision. In either case it looks like your path to the shape prediction model is incorrect. Double-check your paths and ensure you are using Windows path separators (‘\’) instead of Unix path separators (‘/’). Thanks for your great work. But I’m using a windows OS. So how can I install the dlib library correctly for the facial landmark detection? Hi Wallace — I don’t cover Windows here on the PyImageSearch blog. I recommend using Unix-based operating systems such as macOS and Ubuntu for computer vision development. IF you would like to install dlib on Windows, please refer to the official dlib site. Firstly, thank you so much. Your blog is of immense help for a computer vision enthusiast like me. A bit off topic – now days I am playing with YOLO to get real time object detection. I am trying to implement this in Python but without any success. Do you plan to cover this up? I’ll be covering YOLO along with Faster R-CNNs and SSDs inside Deep Learning for Computer Vision with Python. Object detection with deep learning is still a very volatile field of research. I’ll be discussing how these frameworks work and how to use them, but a pure Python implementation will be outside the scope of the book. Keep in mind that many state-of-the-art deep learning frameworks for object detections are based on forks of libraries like Caffe or mxnet. The authors then implement custom layers. It will likely be a few years until we see these types of object detectors (or even the building blocks) naturally existing in a stable state inside Keras, mxnet, etc. why eye, eye ? in dlib eye landmarks to which eye, eye is referring ? These are the individual indexes of the (x, y)-coordinates of the eyes. These indexes map to the equation in Figure 4 above (keep in mind that the equation is one-indexed while Python is zero-indexed). Furthermore, you can read more about the individual facial landmarks in this post. vs.show() no such function found.. This is the error i am getting.. I am able to run the code with built in video.. but not using laptop camera.. please resolve this issue.. There is no function called vs.show() anywhere in this blog post. Did you mean vs.stop()? Great post! Tested this one with mobile phone (iPhone) and it works okay. dlib detection is a bit problematic on iphone camera so sometimes it doesn’t detect blinks because of bad lighting. I like the simple idea behind it. I tried to apply this idea to “eyebrow raise” detection mechanism but the ratio is not changing as drastically as eye ratio. Do you maybe have suggestion or idea to apply the same idea to eyebrow raising or any other facial gesture? Keep in mind that the eyebrow facial landmarks are only represented by 5 points each — they don’t surround the eyebrow like the facial landmarks do for the eye so the aspect ratio doesn’t have much meaning here. I would monitor the (x, y)-coordinates of the eyebrows, but otherwise you might want to look into other facial landmark models that can detect more points and encapsulate the entire eyebrow. Hi Adrian, thanks for this guide. As of now, I’m trying to use this system for wink detection. Right now I’m gathering data, but what I’ve determined is that both EAR’s decrease by something like 40% no matter which eye winks. Then I determine which EAR decreased more, and which decreased less. I may hard code it, if I can generalize it to a ratio indicating a wink, then a difference indicating WHICH eye is winking. From there, I need to make sure it doesn’t give me false positives for blinks and squints (although squints might be impossible to rule out). Can you please help me solve this error? Hi Jinwoo — I would suggest that you read up on command line arguments before continuing. Do you know what is the issue here ? I’ve read what you have linked.. Don’t seem to find the solution here. Please read the article again. It provides a discussion on command line arguments and how to use them. The problem is that you’re not specifying the --shape-predictor argument to your script. Could you also use an IR lighting rig to light up the subject at night time? Because most webcams have the capability to detect IR. its very slow isnt there any way to fasten it ??….. What are the specs of the computer you are using to execute the code? This code can easily run a modern day laptops/desktops. I will be writing an updated blog post that provides a number of optimizations for blink detection on the Raspberry Pi within the next couple of weeks. Stay tuned! Its not accurate at all, even if i move my eyes and don’t blink it count it as blinked. why ? It sounds like you need to adjust the EYE_AR_THRESH variable as discussed in the post. It’s amazing! Thank you, Adrian Rosebrock! I want to use this to my fatigue detection experience. Thanks, I’m happy to hear you found the project helpful! 🙂 Best of luck on your fatigue detection work. Thanks, I found the bug..
Congrats on resolving the issue Shubhank! Could you share your content number so that I can contact you for my project details and idea . Hello! Adrian, thanks for share your experience. how do you add a graphic or plot with the eye blink data? could you share this code to? Are you trying to plot the EAR over time? If so, I would suggest using matplotlib, Bokeh, or whatever plotting library you feel comfortable with. Thank you so much for sharing and I followed all your steps to create a blink rate monitoring as well as a head tilting monitoring using some other data among the 68 points. All works pretty well but I found that the predictor will fail to predict the accurate eye contour when the object is wearing optics. Do you have any suggestion for that? Cause I know in openCV haar cascade there seems to be a specific classifier for eyes with glasses. Will there be a specific predictor built for this case? That’s a great question. If the driver is wearing glasses and the eyes cannot be localized properly, you would likely need to create a specific predictor. Another option might be to try an IR camera, but again, that would also imply having to train a custom predictor. I’ve never tried this method with the user wearing glasses. Have you read about Face Landmark Detection on Dlib website in section C++ examples? Hi thank for your amazing tutorial. But i got an error and i can’t resolve it. can you please help me. Please read the comments before you post. I have already answered this question in reply to “Jinwoo” above. please elaborate it i didn’t get the solution. Read my tutorial on argparse and command line arguments. If you read the tutorial you will understand command line arguments and be able to resolve the problem. Hey Adrian, i really love your tutorial. It helped me a lot for finising my project. But i have some problem making it automatically set the threshold based on the person’s default opened eye EAR (different race, different eye EAR). Like i set it for 0.2, ot worked great for me, but not for my chinese friend. It detected his eyes closed. So i have to manually edit the threshold. Is there any way to make it more dynamic? In short, not easily. I would suggest collecting as much EAR data as possible across a broad range of ethnicities and then using that as training data. Secondly, keep in mind what I said regarding in the “Improving our blink detector” section. You can treat the EAR as a feature vector and feed them into a SVM for better accuracy. I have a quick question about the facial landmark detection: if only a partial face is presented, is it possible to detect any part of the face elements, e.g. only one eye? Or do we need to retrain the data set to just detect an eye? Thanks. Keep in mind that facial landmark detection is a two phase process. First we must localize the face in an image. This normally done using HOG + Linear SVM or Haar cascades. Only after the face is localized can we detect facial landmarks. In short, you need to be able to detect the face first. Thanks for the reply. If we know that the image is only for an eye area, is it possible to use facial landmark to just detect the feature or outline of the eye? Thanks. Unfortunately, no. 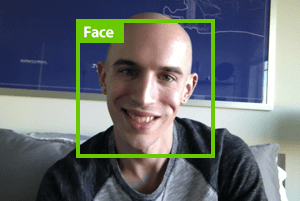 The facial landmark detector assumes you are working with the entire face. If you had just eye images and wanted to localize the eye you would need an eye detector + a trained shape predictor for the eye region. Many thanks for you sharing your knowledge. I’m trying to use your video file and everything is loading without errors but the video doesn’t show at all. I have follow your tutorial on how to install OpenCV and i have install video lib. I found to the web that i could be something with FFMPEG ? It’s hard to say what the exact issue could be, although it sounds likely that your system does not have the proper video codecs installed to read your video. I would suggest installing FFMPEG then re-compiling and re-installing OpenCV. Hi Adrian, thank you very much for the wonderful tutorials and courses that you present each time. First question: Could this flicker detector be used as liveness detection in any facial recognition system?. Second question: Do you plan to prepare a tutorial on some effective mechanism for the liveness detection in a facial recognition system?. 1. Yes, this could be used for liveness detection, although I would recommend using a depth camera as well. 2. I’ll add liveness detection as a future potential blog post, thank you for the suggestion. line 116, its give invalid syntax error, please help,, i am using this code in Windows, and use Webcam of my PC. What is the exact error you are getting? Did you use the “Downloads” section of this tutorial to download the code instead of copying and pasting it? Hi Mohammed — please see my previous reply to your comment. You need to read up on command line arguments. The issue is you’re not supplying the --shape-predictor switch. Can you clarify what you mean by “Python shell”? Are you referring to the GUI version of Python IDLE? If so, the GUI version of IDLE does not support Python virtual environments and it will not work. Please use the terminal or use Jupyter Notebooks. Yeah!!! exactly, now I understand, then I’ll use Jupyter. Hey! How do you contact EAR if the framework returns 8 points for the eye? You might not be able to. How many landmarks are detected around each eye? Ur code cant work for multiple faces at the same time right? Correct, this code is intended for a single face. You can update it to work with multiple faces by tracking each face and associating a counter with each face. Hi Adrian, At first thank so much, you’re the best. I received this warning after install opencv 3.3, before, I was executing the program with opencv 3.1 and I never received any warning, do you know what is it about? It’s important to understand that that is is a warning and not an error. The message has no impact on your ability to execute the code or obtain the correct results. do you know how i should sole it? Unfortunately I’m not sure what the error is here. Can you try using the FileVideoStream class? Hi Adrian thanks for the content! Both my script and the dat. file is in the same directory(desktop),do you know how to make it work? Hi Chris, you must specify the proper path to the file. You also must make sure permissions for files are set. Hi Adrian, thanks for the reply, the error has been resolved. I’m working on images of eyes (just eyes, no face) to find out the drowsiness. Is it possible to use dlib for the case the eyes are cropped out of the face? Or you have better suggestions. Hey Salman — you would need to train your own custom shape predictor for just the eyes. The method outlined in this blog post requires the entire face to be detected which in turns allows the eyes to be localized. Hi, Adrian. Why don’t you use your own custom shape predictor for eye blink detection? Perhaps I’m not understanding your question — we are using a shape predictor for eye blink detection in this tutorial. Hello Adrian, this works amazingly well. I’m currently using it for a project in college where we need to map an eye blink to the time within the video that it occurred. Do you think you can help me modify the code so that I can also log the time (i.e the time within the video) that the blink occurred? Thanks! Also, I was hoping you can show me how to modify the code so that it doesn’t show the video but just works in the background. Hey Daniel, can you elaborate more on what you mean by “time within the video”? Secondly, while I’m happy to help point you in the right direction and provide suggestions please keep in mind that I publish all tutorials here on PyImageSearch free of cost. I’m simply too busy to take on additional customizations. I hope you understand. Sir your explanation is easily understandable..Can this will be implement using c++ in opencv? You can use this method in any programming language provided you can localize the eye region and apply the EAR algorithm. We found that blink detection is improved a lot if the EAR threshold is dynamically set to respond to the mean of recent EAR values. Also, getting some nice graphical output tracking EAR and counting blinks really helped with algorithm tuning. Congrats on the successful project, Andrea! The blink-based lie detection system sounds very interesting. Do you have a writeup of the report so I can learn more about it? That is odd…which version of dlib are you using? Thanks for sharing the version information. Unfortunately I’m not sure what the error would be in this case. I would suggest posting on the official dlib forums. Sorry I couldn’t be of more help here! I need your .exe of program. Can you give it to me? i got this error..how to solve it…. Please read the comments before posting. See my reply to “Jinwoo” on May 7, 2017 (as well as others). Make sure you read on on command line arguments and how they work. I saw your reply to “Jinwoo”…but I don’t understand that. It’s okay if you are new to command line arguments but take the time to educate yourself on them before continuing. i dont know how to set up an argument and path. See my reply to “Mohammed Salman” on September 9, 2017. It sounds like OpenCV cannot access your webcam. Take a look at this post where I discuss OpenCV NoneType errors and how to resolve them. Hei Adrian. Good work. After obtaining the yes, is the a function that i can use to crop both eyes? You can crop the eyes using NumPy array slices. Compute the bounding box of the coordinates and use rectangular coordinates to extract the eyes. hi how can i implement eye blink detection in c#? i am thinking of implementing drowsiness detection using CNN using eyes in the wild data set.The model has to detect the eyes and if the eyes are closed for a certain period of time the model should give some indication to the driver.Firstly,is it possible in real time using CNN.whats the best way to train the model. I am not asking you for code..all i need is,what libraries should i use..how should i save the trained weights.can CNN work on webcam real time streaming.if so,how.? Is there a particular reason why you would want to use a CNN? Before even starting a project you should consider the reasoning behind “why”. The method proposed here doesn’t require a CNN and using deep learning could very easily become overkill. I’m also not familiar with the closed eyes in the wild dataset. Do you have a link to it? Hi, Adrian, and thank you, I have a question, I wanna make an <> based in this blink detection. I add some code lines, removing the average of the EAR for both eyes. I replaced it by something like that: If (leftEAR>rightEAR:left wink) if(leftEAR<rightEAR:right wink), (if leftEAR=rightEAR and <EYE_AR_THRESH, then it's a normal blink), but it always shows the same EAR value for each eye, despite I close just one eye. Thanks!!!! i can run a program succesfully but i also want to make an exe. so how to make . Unfortunately Python + OpenCV together does not lend well to create an executable file. You would need to distribute the source code. Hi , i have a following error. How can I resolve this sir? detect_blinks.py error: argument -p/–shape-predictor is required. See this blog post on command line arguments. Make sure you read the post completely. I don’t think so. Did you do any research on it? we would like to use Python 3.6 with Spyder! can we use this program for making blink detector which u posted? Yes, but you’ll want to make sure the Python interpreter you are using with Sypder can access OpenCV and any other required libraries. I got a problem while installing the dlib. I failed to install dlib even though I searched almost web and blog. Im not sure but many say it is difficult to download the dlib on Window. Is there any way that I can use ur code without dlib? I’d like to make a eye blink detection with Python but without dlib. Do you have any ideas? For this particular code you would need dlib. I have not used Windows in many years so I’m unfortunately not sure what would be causing the issue with the dlib install. Why using VideoStream and threads and not VideoCapture? Thanks! The VideoStream classes leverages threading and reduces I/O latency. See this blog post for more information. And dont you have a problem when killing the thread in python? I have not ran into issues with the thread gracefully exiting. Also, this particular method counts when you look down, do you know how can I adjust more? You can certainly detect winks, just compute the EAR for each eye and then track how long each eye has been closed for. As far as “looking down” you may want to adjust your camera placement or use a more advanced method for eye blink detection, perhaps one that uses multiple EAR inputs as a feature vector. Hello! First I want to thank you, your tutorial have been of great help. I´m trying something similar but with smiles, if I measure the distance of points 49 and 55 (dist.euclidean(mouth, mouth)) I can detect a smile but the problem I have encounter is that the distance change depending of the distance to the web cam. Do you know if there is a way to normalize de distance of the points, making it not dependig of the distance to the camera? Hey Malo — there are a few ways to approach this problem. Is there any particular reason you are relying strictly on the distance? You could attempt use an aspect ratio calculation here for the smile here as well. This would not make the system reliant on the distance. What do you mean with use an aspect ratio calculation? Refer to this blog post. We compute the “EAR” or “Eye Aspect Ratio”. You can do something similar with the mouth landmarks (perhaps a “Mouth Aspect Ratio”) just as a quick test. If that doesn’t work you can normalize the distance of the mouth by scaling it by the width of the face then trying to threshold on it. But how can I meassure the width of the face? It´s not the same problem. Gnna meassure the width of the face doing the distance between two points but thats gonna change depending of how far Im from the camera. You know the bounding box of the face so you can therefore compute the width of the face. You could also compute the width based off two opposing chin facial landmarks as well. If you divide the distance between your two mouth landmarks by the face width you end up with a ratio. This ratio will not change. Try it for yourself and see. yeah..but I couldn´t find an aspect ratio for the smile. one single question why did you use imutils.video and imutils why do you want to publicize yourself when a new person is trying to develop a new component they want to try from scratch why do you want to gain a name when dlib is open source python is open source and ubuntu is also open source why are you doing like this i seriously want to use skiimage dlib numpy for the easy interface and easy understanding instead of your complicated words in the code so how should we proceed? Perhaps I’m not understanding your criticism here. The imutils library is open source. You can use it if you would like or not. That’s really your choice, just like it’s your choice if you want to use other open source libraries such as scikit-learn, dlib, NumPy, etc. It’s really up to you. The reason I used imutils is stated in this blog post — it contains my threaded implementation of the VideoStream class which is more efficient for frame reads. If you want to get rid of “face_utils” you will need to implement it by hand in your own code. You can get rid of argument parsing as well but you should read this blog post first. Have you try make en executable of this code? No, it would be a royal pain and not worth it. Trying to bundle together a Python app that includes the OpenCV bindings and system dependencies would be challenging to say the least. Can you clarify what you mean by “hide a frame window”? I would like to thank you for the great tutorial, especially with clear explanations. i would like to ask is it possible to extract the (x,y) value from any of the point (P1 – P6) as shown in figure 3 ? If so, how should I extract the coordinate ? This blog post actually shows you how to extract the eye coordinates. Lines 94 and 95 extract the (x, y)-coordinates for both the left eye and right eye. You can then loop over each of the respective sets of points. Im (newish to python) and trying to get the blinks to trigger short midi sequences using pygame. I got it to work per se, but the video is paused during playback and then resumes after. Ideally it wouldnt, improving the timing of the next trigger (so they could potentially overlap.) I tried a couple threading situations, but couldnt seem to get the right configuration. Am i on the right track at least? Which will ensure it runs in the background. Many many thanks for this tutorial, It really helped me a lot. Can you make a tutorial on improving the blink detector, as you mentioned in the “Improving our Blink detector”. (13-dim feature vector, SVM). Hey Arfizur — thank you for the suggestion. I have made note of it but I cannot guarantee if or when I may write the tutorial. when i placed my mobile infront of webcam it actually counting the blink of my pic on mobile phone lol!!! Hi Adrian, great tutorial! When I tested it, my EAR was ~0.2 when my face is close to camera, and was increasing and eventually went to ~0.35 when I move my face back from camera (eyes open in both cases), so if I set the treshhold to 0.2, it will not work when my face is not close to camera. Is there a way to handle this? I assume I can multiply EAR by a constant ratio based on the size width of my face shape compared to the width of the entire photo, but I am not sure. You can normalize the EAR by the width (or height) of the bounding box surrounding your face. Give that a try. Thanks Ben, I’m glad you found it helpful! We can apply above code for certain types of people on whom the threshold(0.3) perfectly matches. But if I want apply on large dataset containing many videos then the threshold will not work for all videos. So is there any method from which we can set threshold so that it works for all videos. I thought of one idea like we can store EAR for each frames and then analyse them to set threshold. Anyways you are doing a great work as these topics are not easy to understand but due to these blogs you made these topics easily understandable. See my comments in the blog post. I would suggest taking a temporal approach and taking the EAR over N frames, forming a feature vector, and then training a machine learning model, like an SVM over it. This will make the system more resilient and will not require a threshold. I want to ask about the value of 0.05 / 0.1 / 0.15 / 0.2 /, 0.25. that’s what value is it? and what units? then use the formula how? Awesome work ..I and my team started from a scratch and by looking all your blogs finally after 4 days and 3 full nights I am able to count my blinks!! !..so happy! !…I modified your code little bit as I have used my android camera connected to server so i have not use FileVideoStream instead i used urllib and also i made some other changes like the dataset one and it took me 2 days just to install all the libraries ..
but when the code successfully compiled i forgot all the nights that we spent . Thanks bro!..now i will take this one a slight ahead!..cheers! Congrats Brij! I’m so excited for you and your team! hello sir, thanks a lot for providing code, which is really helpful, Sir I am getting an error in the code and cannot understand how to correct it so if you could help it would really be great. You need to supply the command line arguments to the script. See this post for more details. 1. I see about 100 comments here – is the link at the top to the eye blink counter still the best link? 1. Which link are you referring to? Please be more specific. 2. You can comment out Lines 106 and 107. I do not have a shape predictor for just the eye region. You would need to take a look at the dlib documentation on how to train your own custom shape predictors. Thanks for your great post.Your post has been a great help for my project. Could you explain this paragraph? How do I implement this for eye blink detector? Thanks and respect for your post. You would maintain the eye aspect ratios for the previous set of N frames. Then you would concatenate them into a single list and pass them through a trained model, such as an SVM or Logistic Regression model. hello sir, thank you for this great tutorial! I can run the “real-time-facial-landmarks”, but when I run the “blink-detection”, it told me that ” AttributeError: ‘module’ object has no attribute ‘FACIAL_LANDMARKS_IDXS'”. How can I solve the problem? This was caused in the latest release of imutils v0.5. I’ll be fixing it in within the next few days with a release of imutils v0.5.1, but in the meantime just change “FACIAL_LANDMARKS_IDXS” to FACIAL_LANDMARKS__68_IDXS and it will work. You need to supply the command line arguments to your script. It’s okay if you are new to them, but you NEED to read up on them before you continue. I already went through it. Actually i am doing this program in python shell in windows. I am not getting what to do with this argument here. Argument values we can pass when we try to run the program in terminal, right? I am not doing in that way. I have shape_predictor_68_face_landmarks.dat file in same directory in which main program exist. So i am not sure the need to give argument commands in the program. Opening the file using dlib.shape_predictor alone would do it, right? Don’t launch a Python shell and execute the script. Instead, just open your command line, navigate to where you downloaded the code, and execute the script using the Python executable. Do not use the Python shell itself. If you read the tutorial I linked you to in my previous comment it will help clear up your confusion on command line arguments. There is no need to edit any file. There is no need to edit or open any code. Just change directory to where you downloaded the script and execute it. Hi Adrian, I have a question about dlib point detection. I installed it and everything works ok, except when my eyes aren’t facing straight in front of camera, in some frames it detects eye points wrong, so the points are moving above my real eye points and back again to the right values, and it keeps changing every frame although I don’t move at all. So my question is is there a way to detect those error cases in order to exclude them from calculations? That is odd behavior for sure. Are you using the “Downloads” section of my post to download the code + examples? Or are you using your own implementation? I just built the latest dlib version for the iPhone, and it is the same: if you smile fast too “hard”, so your eyes are almost closed, the detector starts swinging points to your brows and back. Is there a way to detect those cases or even better remove them? I haven’t encountered such a situation. That would be a good question for Davis, the creator of dlib. I would ask him on the dlib GitHub project page. I used https://github.com/zweigraf/face-landmarking-ios this github project to test it on my iPhone, which uses dlib too. The case I’m talking about is when you move your head down, so top part of eyes is a little bit hidden by brows. I tried replacing FACIAL_LANDMARKS_IDXS with FACIAL_LANDMARKS__68_IDXS. It sounds like you’re not actually using imutils 0.5.1 then. v0.5.1 of imutils includes both FACIAL_LANDMARKS_68_IDXS along with an alias variable FACIAL_LANDMARKS_IDXS that points to FACIAL_LANDMARKS_68_IDXS. I know from your previous comments that you’re struggling with executing the script and likely have some confusion regarding Python package basics. I would suggest triple and quadruple checking your install of the imutils package and after that, triple and quadruple checking that your Python environment is indeed importing v0.5.1 of imutils. Thank You so much Adrian. I could resolve it. Actually i was installing imutils with the command ‘pip install imutils’. Thought it would get me the latest version. Isn’t it like that? Anyway now i given command ‘pip install imutils==0.5.1’, and problem is resolved. Thanks again. Hi Adrian,When I type the following command in the terminal, I get this error.I have configured the environment according to your blog.If you can answer me, I will be very grateful. It sounds like you don’t have OpenCV installed on your system. Make sure you follow one of my OpenCV install tutorials to get OpenCV installed on your machine. Hey Preetha — I do not officially support Windows here on the PyImageSearch blog. I highly recommend you use a Unix-based machine like Linux (Ubuntu) or macOS. I provide a number of different install tutorials to get you started as well. I hope that helps! Is there a way to find the pupil of the eyes and track it using this kind of method? I haven’t tried this method, but I know other PyImageSearch readers have gotten it to work. I would suggest starting there. Thanks for replying that quick and also for giving me a starting point. First of all I would like to thank you for your blog.It was of great help. I wanted to detect the blinks for different people in the frame separately.How can I do so? Thanks Manas, I’m glad you’re enjoying the blog! As for multi-person blink detection, that’s totally possible, but will require reworking the code quite a bit. You’ll want to detect all faces in a frame, loop over them, and then maintain separate counters for each of them, allowing you to determine when either of them have blinked. You may also want to perform simply object tracking so you can easily associate IDs with people. Thank you, for giving me some starting point.I would try to implement this. Hey! Adrian, I want to make a project which will detect face and update the attendance in the database. But with simple face detection there is an ambiguity that it can detect fake images too, so in order to differentiate between the fake and real image I got the idea of blinking eye face detection tutorials by you, from git hub . Is it possible to detect blinking eye face and update attendance in the database. Or is there any other alternative to make my project without this ambiguity. What you’re referring to is actually part of a larger field of study called “liveliness detection”. I would suggest reading a few papers on liveliness detection and finding one that is sufficient for your project. Agreed Shivam, what if some one records video of your eyes blinking and use it, the blink would still count right. Correct — that is why I suggested Shivam take a look at “liveliness detection” algorithms. We use your code, but webcam does not open. Which program do we need to install? We use every program that you install. Does the script automatically exit? Does it produce an error message? Any other information you can provide would be helpful. Hi Adrian, can I use a wireless sport camera instead of webcam/usb camera/ raspberry pi camera? Yes, provided that the cv2.VideoCapture function supports your wireless stream. Hi, Adrian, I’ll bet this would be useful as part of a lie detector system used with other clues. That’s assuming that the person is not a pathological liar who is as comfortable with lying as with breathing. Such use has probably been done, ya? BTW did you know that the lie detector was invented by Dr. Marston who created the Wonder Woman comic? There’s a movie about it. We don’t actually train a SVM in this tutorial. I recommended using a SVM if you wanted to improve the method. You would train the SVM offline and then use it in real-time after its been trained. I have only one question ..
Can OpenCV be used to identify the iris and integrate it into Python? OpenCV itself can facilitate building an algorithm to detect the iris of the eye; however, OpenCV does not include any built-in functions that automatically detect the iris. You would need to actually implement the algorithm itself. Thank you. Your tutorial was helpful, but we have a small problem. We are using logi-tech webcam for video streaming, the video is slow what we need to do. Are you running the code on a laptop or a Raspberry Pi? What are your system specs and how large is the input frame? Thanks for a great article. When I am running your code, the blink count is incremented even though I move here and there and keep my eyes open. How can I make it more accurate? Also can this code be implemented in java? You should tune the EAR threshold value. As far as improving the model see my notes in the post about a rolling window of EAR values + SVM. Hi Adrian, I am doing a University project and I wanted to incorporate a fatigue detection camera within the product I am making. Unfortunately I do not know anything about OpenCV, Python, and dlib or coding for that matter. Is there anyway you could help me? You will need to have at least some knowledge of programming to be successful in your project. 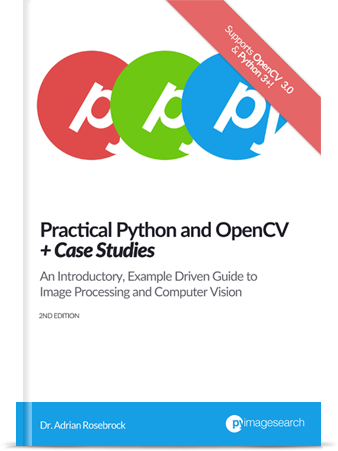 If you’re new to computer vision and OpenCV, that’s fine, but you’ll need to read Practical Python and OpenCV first — that book will teach you the basics. Make sure you follow my dlib install instructions to help you get dlib configured and installed properly. I found that if I didn’t blink but moved my head back and forth, Blinks’ value would also increase, meaning the program thought I blinked. Hi Adrian, can I run this on raspberry pi? if not, are you going to post one for raspi? How can I implement blink detection algorithm and your centroid tracker each other ? I want to create system be like finding faces ,finding id’s and counting ids blinks . How can I do it can you help me ? I would suggest you take your time and start slow. I assume you have been able to get them both to run independently, correct? If so, the next step is to start start incorporating facial landmark detection into the centroid tracking code. Detect landmarks for each face and visualize them. Make sure they are working. From there, extract the eye regions. Then move on to computing the EAR. Finally, add in the variables to detect blinks. Take your time, go slow, and debug often. 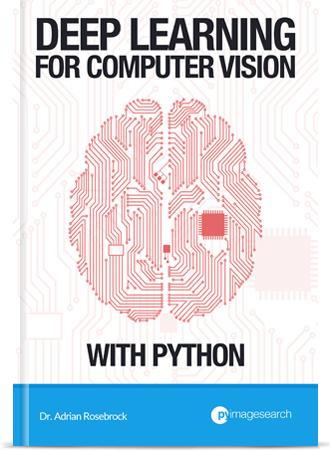 And if you need additional help, refer to Practical Python and OpenCV so you can learn the fundamentals of computer vision and image processing. 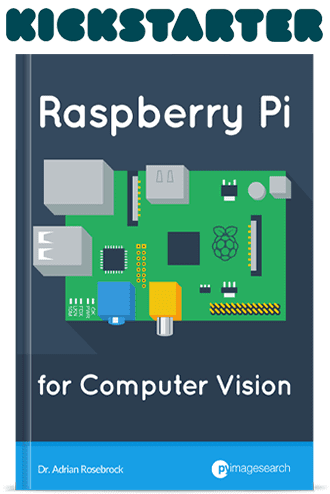 That book shows basic examples of how to build computer vision applications. I’m confident it will help you here as well. This code works like a charm with people who do not wear spectacles, but is gives very ambiguous results for people wearing spectacles. Is there any way to fix this? You are awesome. I have learn a lot from you; and actually I am looking for gaze/eye tracking code, do you post any? Sorry, I do not currently have any tutorials on that topic. Hello Adrian, thanks for your useful articles. is there any option to runs blink detection without using dlib packages? if exist, what should i prepare or do to make it? Then a blink is falsely detected. How can I go about solving this? Hey I’m trying to add functionality of detecting when a tongue is sticking out but I’m having problems making it work. I’m trying to take the color above the lower edge of the lower lip and the color below it which are supposed to be pink above and skin color below and then when a tongue is sticking out its pink both above and below. But the color difference is not distinguishable enough. Do you have any other ideas? Interesting project. I don’t have any tutorials on that topic but I’ll consider it for the future. Thank you for the suggestion Sam!